Jahja Ling Returns to San Diego Symphony Orchestra as Conductor Laureate for the first time! 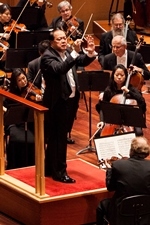 October 2016 saw Jahja Ling conducting the opening weekend of concerts for his 13th and final season as Music Director of the San Diego Symphony. The concert featured violinist Gil Shaham performing the Mendelssohn Violin Concerto as well as the Brahms Symphony No. 3. Mr. Ling opened the concert (and the American music-themed season) with William Schuman’s American Festival Overture. Enthusiastic reviews for these concerts can be seen on the Reviews page. San Diego Symphony’s Orchestra Board of Directors Commissioned David Bruce to Compose New Work in Honor of Jahja Ling, for his Legacy as Music Director! 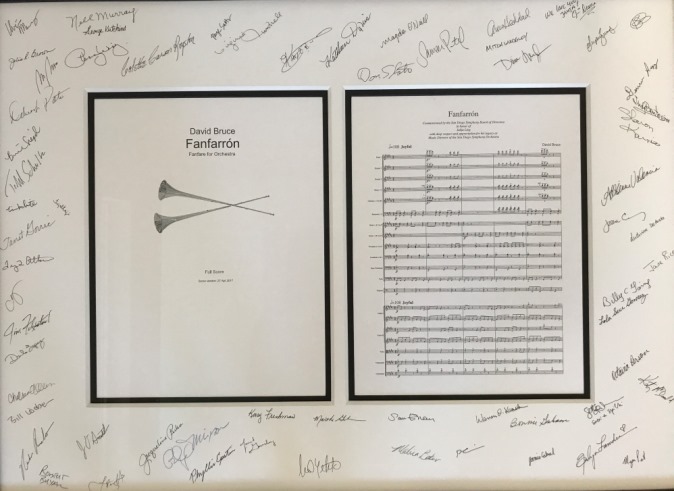 This new work, titled “Fanfarrón,” was given its world premiere by the Orchestra, conducted by its Associate Conductor, Sameer Patel, at the Farewell Tribute on May 28, 2017 at Copley Symphony Hall, immediately after Maestro Ling’s last concert as Music Director. 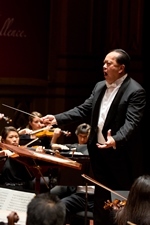 Previously, Mr. Ling and San Diego Symphony Orchestra commissioned from David Bruce Night Parade, which was given its world premiere October 2013 at Copley Symphony Hall in San Diego and subsequently performed by Mr. Ling and the Orchestra at their sold out debut concert at Carnegie Hall in New York City on October 29, 2013. The work was then performed during their historic China Friendship Tour that followed directly after, including at the National Center for the Performing Arts in Beijing. The following year, Mr. Ling and the Orchestra once more commissioned David Bruce to compose a new violin concerto, “Fragile Light,” which received its world premiere with Gil Shaham as soloist under Mr. Ling’s direction in December 2014 at Copley Symphony Hall in San Diego, later travelling to Palm Springs the following January to perform it with Shaham at the McCallum Theatre. Jahja Ling Awarded Proclamations from Mayor and City Council of San Diego plus a Commemorative Gift from the Symphony Musicians! 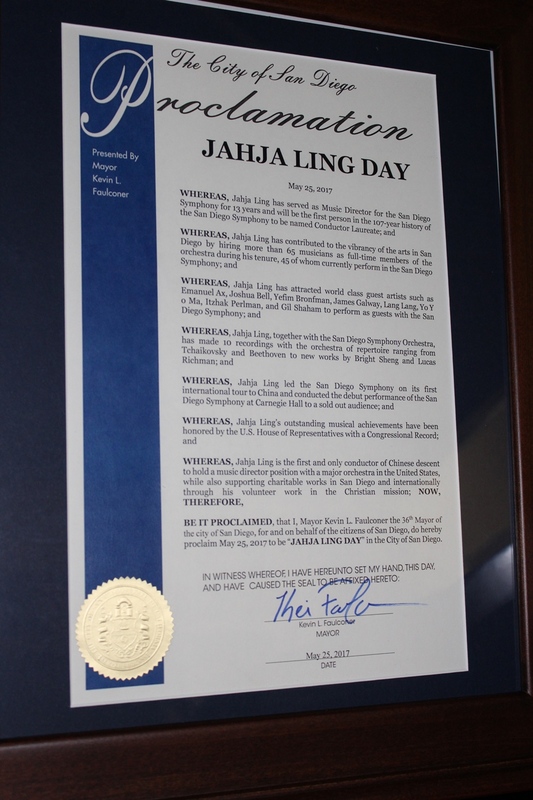 San Diego Mayor Kevin Faulconer stopped by Copley Symphony Hall to declare May 25, 2017 Jahja Ling Day in the City of San Diego by proclamation of the Mayor. (photo above). 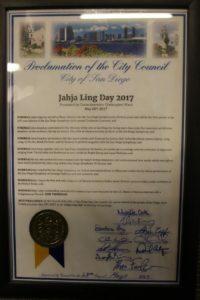 And at the conclusion of his final concert as Music Director with the San Diego Symphony, City Councilman Chris Cates declared May 28, 2017 Jahja Ling Day in the City of San Diego by proclamation of the San Diego City Council. On the same day, Jahja Ling received a special commemorative version of the famous “Great Performances” Sibelius Symphony No. 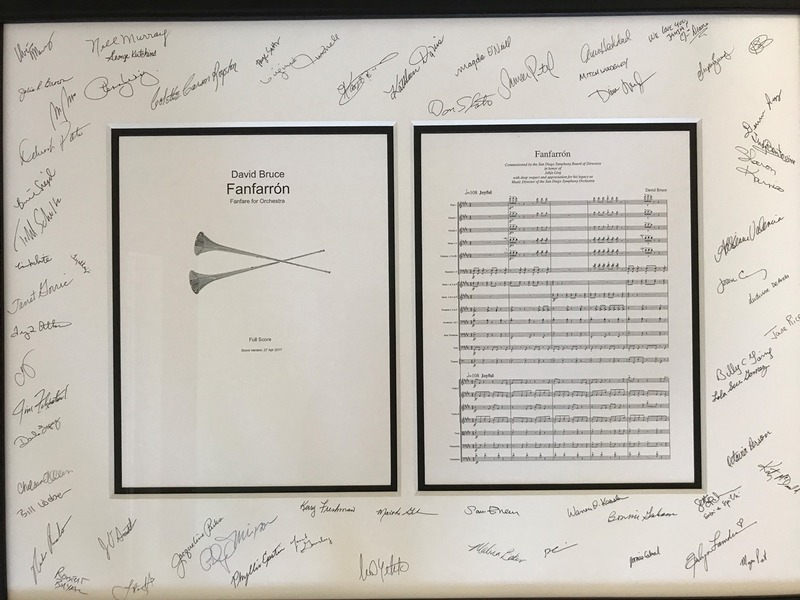 2 album cover as a gift from the musicians of the San Diego Symphony Orchestra. Jahja Ling Concludes 13-Year Tenure as San Diego Symphony’s Music Director with Tributes and Ecstatic Reviews! 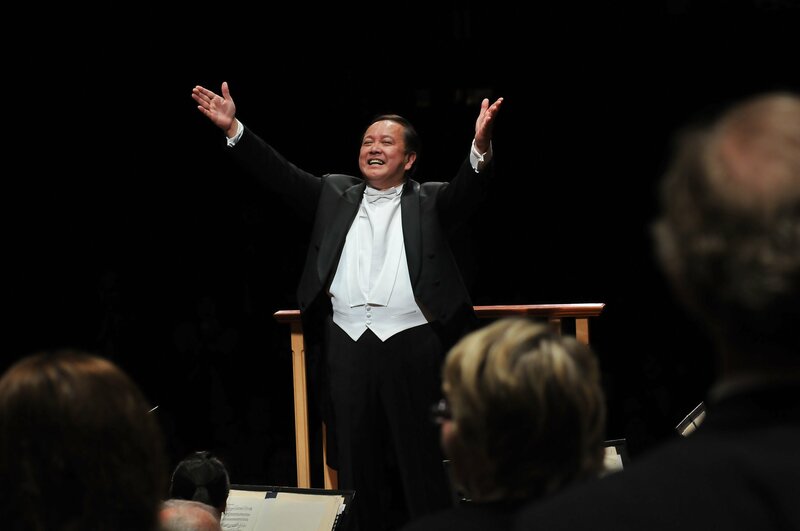 In May 2017 Jahja Ling concluded his 13 years of service as Music Director of the San Diego Symphony before becoming that organization’s very first Conductor Laureate. The occasion was accompanied by a published series of tributes: a congratulatory program book letter from San Diego Symphony CEO Martha Gilmer; an interview with Ms. Gilmer; a timeline of Maestro Ling’s years with the SDSO; a listing of all works introduced to the SDSO by Jahja Ling; an appreciation article by the SDSO’s longtime Archivist, Dr. Melvin G. Goldzband; and a listing by section of all San Diego Symphony appointments by audition successfully completed by Jahja Ling in his time as Music Director. In his final months as Music Director, Jahja Ling led the San Diego Symphony in highly acclaimed performances of Bruckner’s Symphony No. 8 and Mahler’s Symphony No. 3. (Several very positive reviews of these performances can be found on the Reviews Page.) For his final weekend of concerts, Maestro Ling led the SDSO in performances of Brahms’ Second Piano Concerto – with special guest Yefim Bronfman – and Sibelius’ Symphony No. 2. 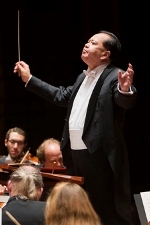 For his final weekend of concerts with the San Diego Symphony as Music Director, Jahja Ling received ecstatic reviews from the San Diego Union-Tribune and BroadwayWorld.com. 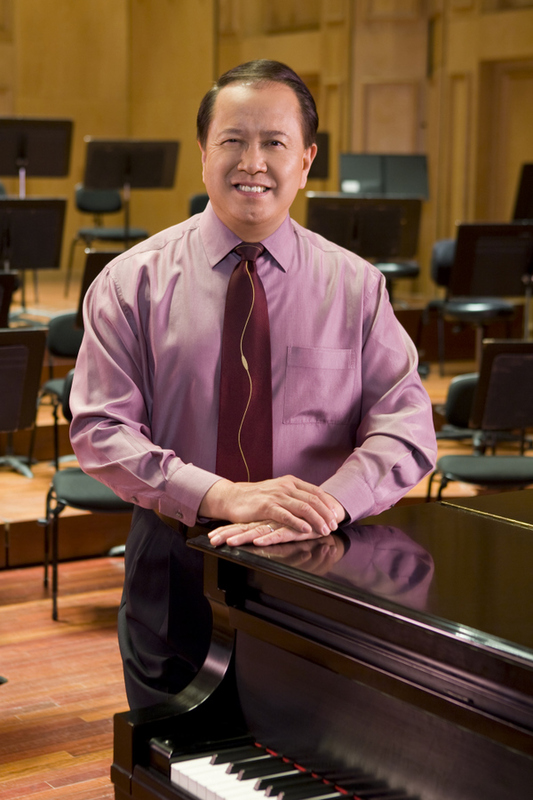 Retrospective articles about Jahja Ling’s tenure as SDSO Music Director have begun to appear. Erica Miner, an award-winning author who served for over two decades as a Metropolitan Opera violinist, and had previously performed under Leonard Bernstein and studied with Boston Symphony concertmaster Joseph Silverstein, has written an overview of Ling’s career which has been published by both LAOpus.com and Broadwayworld.com. San Diego Magazine ran a retrospective article in May as did Fine Magazine. The San Diego Union-Tribune published a front page article looking back on Ling’s journey from being hired as SDSO Music Director to his final weekend, including appreciations from several Symphony musicians and CEO Martha Gilmer. San Diego’s public television station KPBS ran a summary story about Mr. Ling’s tenure conclusion during their nightly Evening Edition broadcast. KUSI broadcast a video interview with Mr. Ling covering his career and final concert weekend, and Fox 5 News mentioned Mr. Ling’s departure on their website. Jahja Ling Receives Classical Music Icon Award from Bravo San Diego and San Diego County! 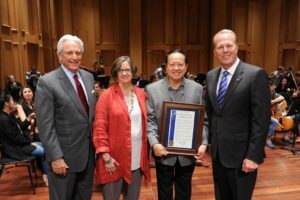 In January 2017, Jahja Ling received a Classical Music Icon Award from Bravo San Diego and San Diego County Supervisors Dave Roberts and Kristin Gaspar in recognition for his services to music and the arts in San Diego County. The ceremony took place in the San Diego County Administration Building. Fellow 2017 Icon Awardees were Cabaret Icon Leigh Scarritt, Theatre Icon Linda Libby and Dance Icon John Malashock. Jahja Ling Receives 2016 UPLIFTing Award! On November 1, 2016, Jahja Ling recieved an UPLIFTing Award from UPLIFT San Diego. UPLIFT stands for Urban People Living in Faith & Trust. They are a non-profit Missional Ministry, founded in 1987 to serve in San Diego’s Inner-city and beyond. Today UPLIFT Volunteers transform lives through essential Student Services & Homeless Services. Their motto is “Four Programs – One Purpose, to lift up San Diego with God’s Love.” UPLIFT honored Jahja Ling and four other prominent San Diego leaders for their acts of faith, love & goodwill in the community. Jahja Ling Opens 13th and Final San Diego Symphony Season with Well-Reviewed Concerts Featuring Violinist Gil Shaham! Jahja Ling Concludes 12th SDSO Season to Rhapsodic Reviews! In April and May of 2016, Jahja Ling led the San Diego Symphony Orchestra in a series of concerts highlighting glories of the Austrian, German and American repertoire. The end of April saw two well-received performances of Gustav Mahler’s Symphony No. 6, the Tragic. Two weeks later cellist Johannes Moser appeared in performances of Richard Strauss’ Don Quixote in concerts that also featured Richard Wagner’s Siegfried Idyll and Franz Schubert’s Unfinished Symphony. The season concluded with an all-American program of music by Samuel Barber (School for Scandal Overture), George Gershwin (Piano Concert in F, stunningly interpreted by Jean-Yves Thibaudet), Aaron Copland (Appalachian Spring) and Maestro Ling’s great teacher Leonard Bernstein (Chichester Psalms). The excellent notices for these concerts can be seen on the Reviews page. Jahja Ling in Residence: Distinguished Principal Guest Faculty at Cleveland Institute of Music! Jahja Ling Conducts + Performs at SDSO’s Piano Festival! Jahja Ling Begins his 12th Season in San Diego! After his concerts in China and Jakarta, conductor Jahja Ling returned to the United States just in time to celebrate his remarkable, unprecedented 30 year association with The Cleveland Orchestra. An August 15 Severance Hall concert featuring pianist Orion Weiss was conducted by Mr. Ling; the following evening he conducted at concert at the Blossom Festival in which cellist Yo-Yo Ma made a special appearance complete with a special 30th Anniversary cake for Mr. Ling! CLICK HERE to read more about this very special Cleveland weekend! Jahja Ling in Hang Zhou and Jakarta! 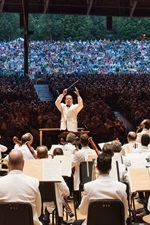 Conductor Jahja Ling had a very eventful summer of 2014. He conducted concerts in Hang Zhou, China as well as in his birthplace, Jakarta, Indonesia. 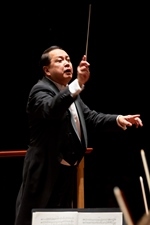 Mr. Ling conducted the Third Symphony of Johannes Brahms with the Hang Zhou Philharmonic, a performance applauded by the audience for six curtain calls. With the Jakarta Symphony and the Jakarta Oratorio Society, Jahja Ling conducted more Brahms: the monumental German Requiem. The Jakarta concert was a very special occasion for Mr. Ling, representing the concert debut of his oldest daughter, Priscilla Ling, performing J.S. Bach’s Piano Concerto in F minor.The concert also featured Jessie Chang (Priscilla’s mother) performing Ludwig van Beethoven’s Piano Concerto No. 2 in B-flat Major. CLICK HERE to read more about these concerts! Fine Magazine has published a feature article about Jahja Ling and his wife and fellow musician, Jessie Chang, in their August 2014 issue! Jahja Ling in Australia and Hong Kong! After receiving a call on Sunday evening March 9, Jahja Ling was suddenly starting his scheduled Australian tour a week early! 35 hours, five airports and three very long flights later, he had arrived in Perth to rehearse the West Australian Symphony Orchestra for weekend performances in place of their indisposed conductor with a half hour to spare! Per The West Australian reviewer Rosalind Appleby, the performance of music by Elgar, Tchaikovsky and Strauss came off very well, especially given the extraordinary coordination of effort to ensure Mr. Ling’s timely arrival for his single day of rehearsals! Just after his Australia visit, Jahja Ling stopped by the Hong Kong offices of the South China Morning Post‘s senior music critic for an in-depth feature article. 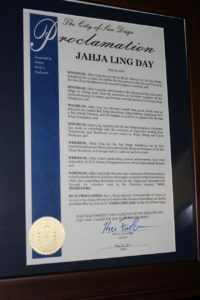 Jahja Ling, San Diego’s Ambassador for the Arts! Jahja Ling is a conductor, music director and pianist. 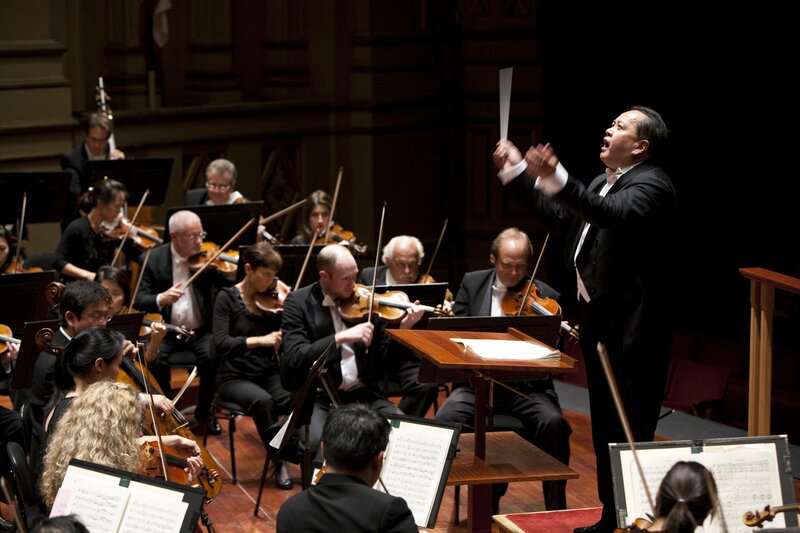 Since 2004 he has been the music director and conductor of the San Diego Symphony. 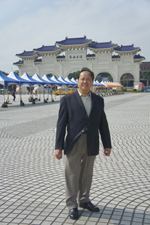 He is of Hokchiu Chinese descent, formerly an Indonesian citizen and is now an American citizen.